The 100th episode is here! It seems like only months ago there was a new show premiering based on the Brothers Grimm fairytales, and yet here we are five years later at episode 100. Oh, how time flies. This episode picks up right where the 99th left off: Nick and Monroe have fallen through the ground, Andrew Dixon has been shot in the middle of his pep rally in the park, and no one is safe! Hank and Wu quickly find where the sniper, Marwan, took aim at Andrew Dixon but Marwan’s already gone, of course. Meanwhile, Eve has also arrived at the scene and she is taking a much more laid back approach to the events at hand. With her heightened Hexenbiest powers, it’s a whole lot easier for her to locate some amateur hawk-like Wesen than it is for Hank and Wu. As Marwan checks in with his superior, Lucien Petrovitch, at Black Claw to tell him the deed is done, Eve causes an innocent passing cyclist to swerve and hit Marwan and knock him unconscious. Then she performs some creepy Hexenbiest voodoo by breathing what I can only assume is the Black Plague into his mouth before snatching up his phone and leaving the scene. Hank, Wu, and Renard reconvene at the precinct. The assassin was successful: Andrew Dixon is dead, and none of them can figure out why Marwan would have targeted Dixon in the first place, or where Marwan escaped to. As far as Renard knows, Dixon wasn’t Wesen, so it’s unclear why a regular human politician would be the target of a Wesen assassin. Eve brings Marwan’s phone back to Meisner, who puts a tracker on it before having Eve return it to him and lift whatever trance she put on him. It would probably save everyone a lot of time if Meisner and Eve would actually work with Hank, Wu and Renard, but apparently communication is no one’s strong point this episode. While Marwan is still hospital-bound thanks to Eve, Lucien places a cryptic call to the precinct, disclosing Marwan’s location. Marwan has been compromised and Lucien has no use for a compromised agent. Marwan is just leaving the hospital when Hank pulls up. Marwan takes off but runs into Wu and then Renard, who were close by. Renard makes quick work of killing the assassin who killed his friend. But it’s not over yet. When Renard gets back to the precinct, he begins viewing the video footage of the shooting and sees that Rachel, the feisty redheaded reporter he’s been sleeping with, is glancing conspiratorially up at the very hotel window where Marwan took his deadly shot at Dixon. It seems Rachel is more than just some ambitious reporter. When Renard confronts her, it turns out Rachel’s not only Wesen, she’s also a Black Claw agent. She’s been working with Lucien and the now departed Marwan, and their plan was to assassinate Dixon so Renard could take over the campaign and become the Black Claw leader in the process. Now Renard has a choice to make: embrace the power he’s always longed for by taking over an organization that is out to destroy Grimms, or continue to do the good he’s been doing by allying with the Grimms in his life. Meanwhile, after falling through a hidden hole in the ground at the end of last episode, Monroe and Nick have found themselves in the catacombs of the ancient church they were looking for all along. They quickly deduce that the cross on the map must stand for a skull and crossbones because there are a ton of skeletons in the catacombs. They immediately start shoving all the old bones out of their way in their search for an “X” which seems rather disrespectful to me. And knowing all the various unexplainable things they’ve come up against in the past, I would assume they’d think twice before desecrating an 800-year-old burial area. But that’s just me. You do you, boys. After poking around for a while and breaking a bunch of fragile, ancient bones in the process, they finally determine that wherever the “X” is, it’s not visible in the lantern light, so they decide to turn their lanterns off and brave the darkness, surrounded by skeletons. Not creepy at all. Once it's pitch black, they’re able to see that there are seven skulls glowing gold in the darkness and forming a circle. Behind these creepy glowing skulls is a silver “X” in a stone wall. Once they’ve gotten through the X-marked wall, they find a really old looking treasure chest with seven locks, presumably for the seven keys. Monroe waxes nostalgic about the history and meaning that could be contained in the treasure chest, conveniently forgetting they haven’t actually managed to open it yet. All Monroe’s poetic musings are for naught because they can’t manage to get the chest open, due to the fact that they’re two keys short and Monroe forgot his lock picks (who forgets their lock picks when embarking on a treasure hunt? I expected better of you, Monroe!). Just as they decide they’ll have to bring the treasure chest back to Portland, Monroe stumbles upon some royal skeletons buried in velvet robes and bedecked in jewels. No explanation for those dudes and no time to figure it out. Nick calls Monroe to a different chamber where he’s discovered a way out, which is currently caved in. I’m really wondering if we’re going to get back to those royal skeletons at some point later in the season or if that was just a throwaway scene. 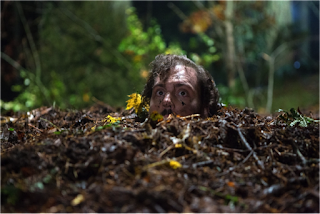 After a lot of digging, Monroe and Nick finally make their escape up through the ground. Someone should really teach these Hollywood folks how dirt actually works because Monroe popping his head out of the ground like a gopher and all the dirt conveniently moving out of the way in neat little sections clearly defies the laws of nature. Getting back out of the catacombs was only half the battle though, as Nick and Monroe soon realize. The Wesen priest and his lackeys are closing in and it doesn’t take long for Nick and Monroe to put two and two together and realize the priest is a bad guy who wants them dead. Fortunately, they’re able to sneak around them, thanks to a timely distraction by Monroe. After a quick scuffle in which Monroe gets badly bitten by a fellow Wesen, he and Nick are on their way back to Portland. While Nick and Monroe were busy desecrating ancient churches, Adalind and Rosalee were getting some premium girl time in back at the spice shop. But because no character on this show is allowed any downtime, this turns out to be our chance to finally meet the mysterious man from Rosalee’s past. As Rosalee and Adalind are chatting over tea, Toby, the highly deplorable former friend, shows up demanding $5,000 from Rosalee. When she refuses, he hits her and starts smashing herbs and spices right and left (not dissimilar to Nick and Monroe’s method in the catacombs). Of course, Toby’s a Wesen and a creepy squid-like breed at that. Rosalee doesn’t even attempt to go up against him. Adalind, however, is another story. When she comes out of the back room to defend Rosalee, her dormant Hexenbiest powers come back to life and wreak havoc on Toby, physically and mentally. He flees as fast as he can. Adalind begins freaking out immediately. She has been quite happy being normal and good these past few months, and the idea of going back to being an evil Hexenbiest is terrifying. Of course, the writers have been foreshadowing the return of her powers for a while now, so the viewing audience is much less surprised by Adalind’s returned powers than Adalind herself is. Rosalee urges Adalind to tell Nick about her powers as soon as she gets the chance but Adalind is afraid he’ll kick her and their baby to the curb once he finds out. This seems like a legitimate concern judging from Nick’s track record with the Hexenbiests in his life. Rosalee agrees to help find a way to continue to suppress Adalind’s powers. 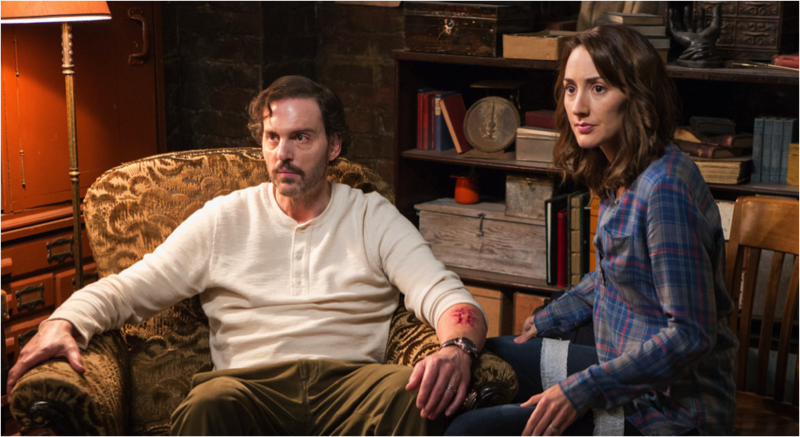 Monroe and Nick make it back to Portland and immediately head to the spice shop to meet up with Adalind, Rosalee, Hank, and Wu. With everyone inserting the keys at once, and the use of Monroe’s lock picks, they manage to get the chest unlocked but it still won’t open. Nick tries using his blood as the final “key” and it works. This was a treasure buried by seven Grimms, after all. The chest contains something rolled up in ancient cloth. After carefully removing it, they discover this object that people have been killing each other over for 800 years is a... stick. Now, as an avid Harry Potter fan, I immediately recognized this object as a wand. But the Grimm team must not do a lot of Harry Potter reading/watching because they are immediately disappointed and confused about the great 800-year-old treasure being a stick. Before they can get too carried away in disappointment and speculation, Monroe starts to have a bad reaction to the nasty bite he got back in Germany. He collapses under the raging infection and blood poisoning from the bite. As everyone surrounds him, trying to figure out what to do, the bite starts healing itself. In a matter of seconds, the wound is gone, Monroe is conscious again and the team is dumbfounded. Until they realize Nick is still holding the stick from the treasure chest in his hand. Apparently this is not just some ordinary 800-year old stick (duh). It has healing powers, and who knows what else. I think the Grimm writers did a fantastic job on the 100th episode. We still have approximately 82,000 open plot lines going which gets a little overwhelming, and we didn’t really wrap any of them up this episode, but we did make some headway on them. Toby is obviously not gone, and I can’t wait to see the inevitable confrontation between him and Monroe when Monroe finds out Toby backhanded Rosalee. I hope Toby’s death is slow and painful. And what will happen with Adalind and her returning powers? Will she be able to be a “good” Hexenbiest? Is that even possible? And of course, there’s Nick’s new toy — the Elderwand. (I can only assume we’re going with this name, yes?) I’m really excited to learn what other abilities this wand possesses, and not gonna lie, I would love to see Nick start carrying this wand around in his belt, right next to his gun holster. Do they make wand holsters? He should really look into that.